Water resistant, sanitary, dual display precision scale. A durable, rapid-response food processing scale that enhances safety, efficiency, and productivity even in harsh environments! The OHAUS Valor 2000 water proof food scale raises the bar and sets a new industry standard with the winning combination of speed and durability. Available in both stainless steel and plastic housing designs, Valor 2000 offers large LED front and rear displays, food safety and puncture resistant keypads, making it the premiere value scale for use in dry or washdown environments. Knife Proof Keypad Prevents Damage from Sharp Objects - Valor 2000 has a polycarbonate keypad that can endure contact with knives or sharp instruments used daily in demanding food preparation, processing and portioning applications. The Flow-Thru Design Protects Valor 2000 in Harsh Environments - Safe to use in the weighing of liquids and in wet environments, Valor 2000 is NSF Certified and has an IP68 flow-thru design which channels fluids that may enter the housing through strategically located drain holes, ensuring the scale remains clean and operational. Fast Speed and Large Dual Displays Allows More than One Operator to Easily Work on Valor 2000 - With less than half a second stabilization time and front and rear LED displays, multiple operators can efficiently utilize one scale for the same job. 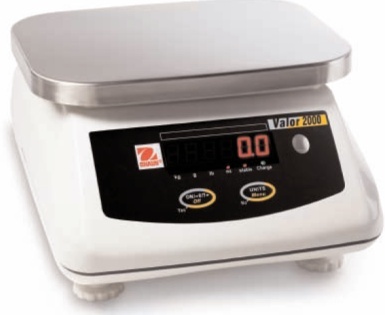 Stainless Steel Version Offered with Extra Check Weighing Mode - The Valor 2000 stainless steel models feature an easy to clean, rigid and protective 304 stainless steel top housing with check weighing mode, expanding its functionality. The Valor 2000 is constructed with highly durable 0.5 mm thick polycarbonate keypad which is impact and puncture resistant. Valor 2000's smooth glossy surfaces easily repel stains, moisture, corrosive fluids and food contaminants, and stainless steel models offer an extra layer of protection. The flow-thru, water-proof design allows for weighing of liquid components and can be used in harsh environments by channeling fluids that may enter the housing to strategically located drain holes, ensuring the scale remains clean and operational. The internal components and connections are silicone sealed to protect the scale from fluids and from condensation that may form inside the scale from constant temperature changes in a typical processing environment. The scale can be easily washed off at the end of each shift to keep it in sanitary condition and avoid the growth of bacteria from food contaminants. Not only does Valor 2000 display results in less than half a second, but with its front and back displays, more than one operator can use the scale for the same job, truly bolstering productivity. The 304 stainless steel Valor 2000's provide an extra layer of protection, as well as an additional checkweighing mode. This ruggedly durable and easy to clean model enhances the scale's usability for all checkweighing applications, including sorting, portioning, and quality assurance. The 100-240 VAC universal power adapter can be operated from virtually any power source and can automatically switch to adapt to different power and voltage lines. When plugging in your machine is not an option, the built-in, rechargeable lead acid battery will provide power for 50 continuous hours, ensuring uninterrupted operation for more than a full work week! Adapter connection cover underneath the scale is spring loaded to ensure the power receptacle is protected from the ingress of moisture, especially when the scale is washed down. Large fully rubberized feet are located at extreme corners of the scale to ensure a wide stance and surface resistance that minimizes the risk of the scale sliding or falling off smooth surfaces. The rubber of the feet extends to the shaft that ensures no grooves are exposed when fully extended; a design that passes NSF standards. Valor 2000® was designed with the basic weighing needs of the food industry in mind. The LED display window is 20.5mm high, which is bigger than most competitive products. It is exceptionally easy to setup and operate, resulting in increased productivity. Check Weighing (V22XW only) - Use the bright red/yellow/green LED's to easily fill containers and packages by weight - great for sorting, grading and portioning. The Valor 2000 is Certified to NSF/ANSI 169 Special Purpose Food Equipment and Devices and is USDA-AMS Accepted to NSF/ANSI /3-A14159-1 Hygiene Requirements for the Design of Meat and Poultry Processing Equipment.